Mexican layered dip--can find on the internet--recipes about the same--you layer refried beans (I make pinto beans and puree them) sour cream, guacamole, and top with cheese, green onions, and a few chopped tomatos. Delicious served with tortilla chips. 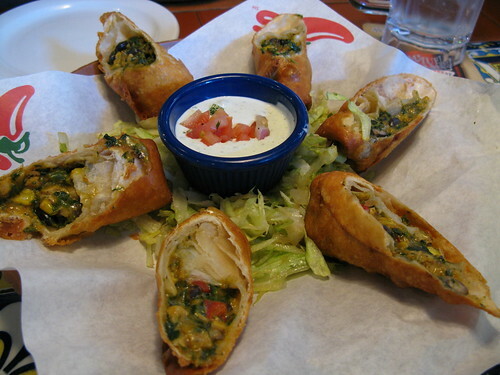 The DW was able to duplicate those South-Western Eggrolls from Chili's. But she bakes them insted of frying. It's basically a tortilla with corn, cheddar, spinach, chicken, red peppers, black beans and spices. All the pieces need to be of uniform size like the corn kernels. She makes a Ranch and cilantro dipping sauce. This is my italian-mexican fusion recipe that came from trying to bring Pico to an office party... it worked out great. take a loaf of bread (italian bread works but it is your choice just pick one with a nice crust and good texture) slice about 1/4 to 1/2" thick slices (slices should be small enough to eat in 2 bites or so) brush with olive oil and toast lightly. Just before serving spoon on the Pico de Gallo. Garnish with cilantro leaves and avocado slices. These look great arranged on a platter and make it much easier to serve the pico than a bowl of chips. Assemble them by spooning a little bit of salsa onto each chip. Place a shrimp on the salsa. Top with a little bit of guac (this is easily done if the guac is in a piping bag, but, it needs to be SMOOTH so the tip doesn't clog). Here's a few I had in my library... hope it's not too late!! 1. Move oven rack to lowest position. Heat oven to 400ºF. Lightly grease springform pan, 9x3 inches. 2. Mix flour, butter and egg yolk. Press mixture evenly on bottom of pan. Bake about 15 minutes or until golden brown; cool. 3. Reduce oven temperature to 350ºF . Mix cream cheese and seasoning mix in large bowl. Stir in eggs, one at a time, mixing well after each addition. Stir in Cheddar cheese and chiles. Pour over crust. 4. Bake about 40 minutes or until center is set. Immediately spread with sour cream. Bake 5 minutes. Cool slightly. Cover and refrigerate at least 8 hours. Remove side of pan. Cut cheesecake into wedges. Serve with crackers. 2. Cover and refrigerate 1 hour to blend flavors. Store covered in refrigerator up to 2 days. Mix all ingredients except tamales in crockpot and heat until melted. Remove corn husks from tamales and crumble into melted cheese mixture. Frozen or canned tamales are fine. Thaw if frozen. Have a bowl of tortilla or corn chips available to scoop up dip or warm flour or corn tortillas so they can use as a filling. OMG! I want the recipe one way or the other---we can now get tortillas now---those look fantastic and I have an afternoon Fat Friday to give on April 11. Please, I'll never make fun of your watermelon hat anymore, Jeeks!! I want the recipe for those SW eggrolls, too! I loved loved loved them when I lived in the States... I always ordered them as my meal when I went to Chili's. They're to die for. I hate to deep fry, so I'd love to try a baked version. I think DH would love them, too, though he's never tried the original. Here's a recipe I found on the net. Instead of frying them, put them in the oven on a baking sheet until the tortilla is crispy. You need to keep turning it though. They freeze good too. Not to sound dumb.... so I take it that your DW slices the rolls after baking, right? I'm serious I have about 15 ladies coming on the 11th and I know that they love American hors de oerves........ranch dip & veggies was a novelty dream come true for them. them..........ok, jeeks, I'll be nice to you now on..............where can i get that smiley that is whistling and looking upwards?